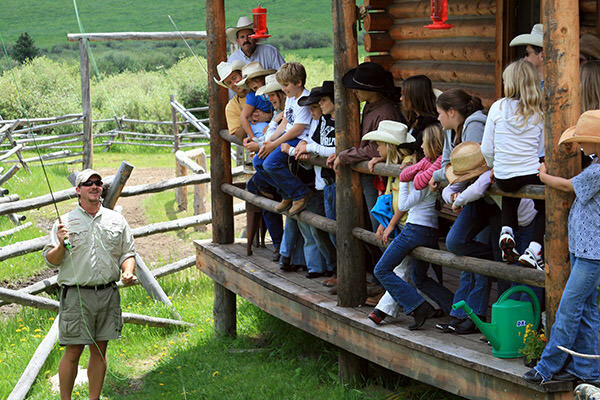 With 100 years of ranching history, award-winning Lost Valley Ranch in Colorado is a great way to experience the Rocky Mountain West through horseback riding, hiking, and incredible fly-fishing and spin-fishing. 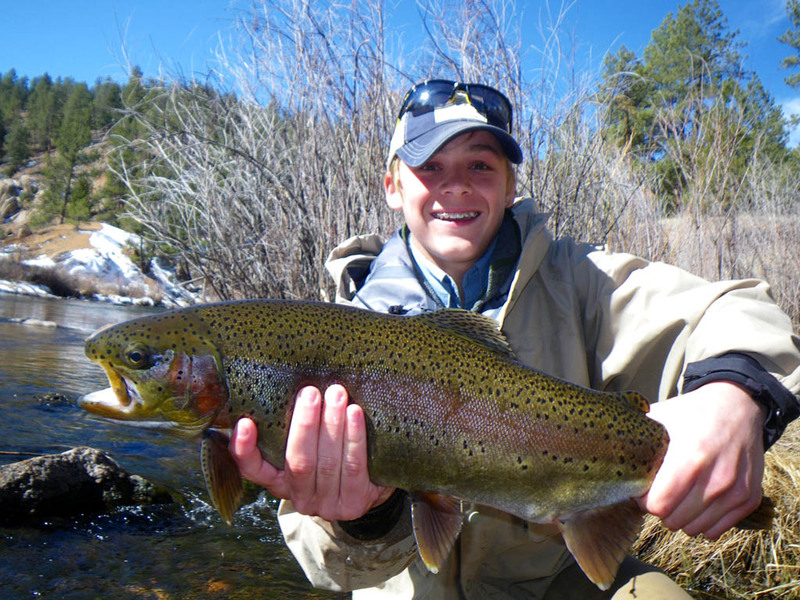 Lost Valley’s streams and lakes are a prime fishing spot for rainbow and brown trout, and this Colorado ranch provides everything you need to reel em’ in. In addition to Goose Creek, which runs from the south to the north on the ranch, Lost Valley also boasts a two-acre pond, with rods and reels available to guests at no additional charge. Rainbow and brown trout are both tasty catches, and in addition to the experience of catching your dinner, the expert Lost Valley chefs are more than happy to prepare your fish and serve it up at meal time. In the shadows of the magnificent and iconic Grand Teton range, Triangle X Ranch provides an unforgettable Wyoming dude ranch experience. In addition to the unparalleled horseback riding, superb mountain scenery, abundant wildlife, and a quiet country pace, you can experience a way of life four generations of the Turner family have been sharing since 1926. 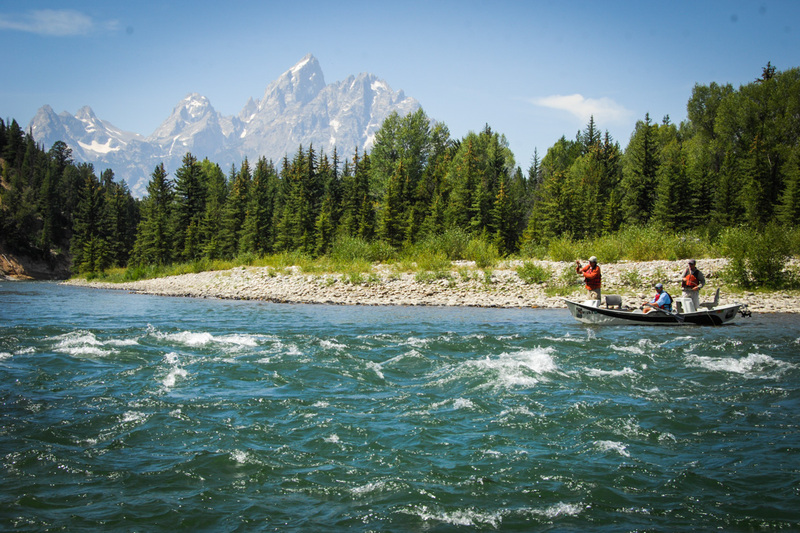 Additionally, Triangle X welcomes anglers of all abilities to embark on their guided fly or spin casting fishing trips in the Grand Teton and Yellowstone National Park region. There you will enjoy a rich diversity of fishing opportunities which includes small spring creeks, secluded mountain lakes, and rolling freestone rivers. Environmental stewardship at Triangle X Ranch is very important and all trips are conducted with the well being of the fish, their habitat and surrounding environment as a top priority. Guides require the use of barbless hooks, lead free fishing materials, artificial fly or lure only, and all trips are catch and release. 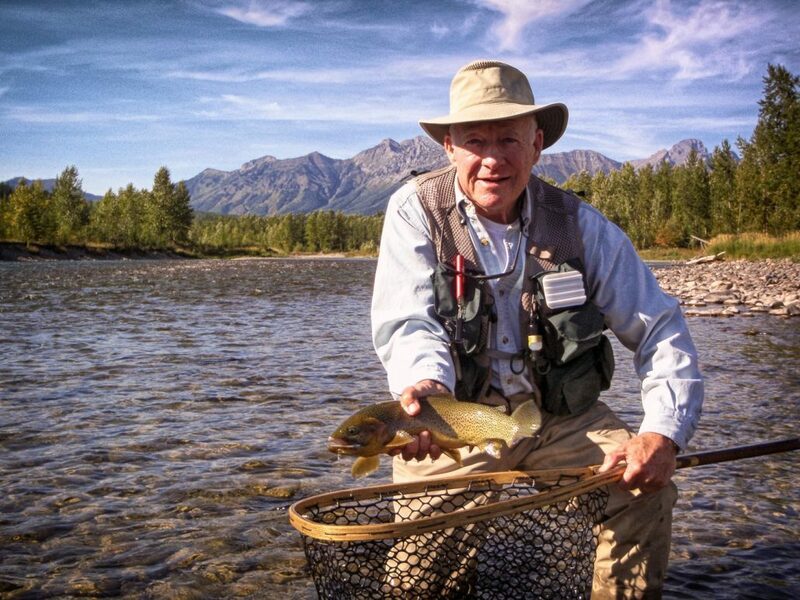 From May through October The Hideout Lodge & Guest Ranch, located 55 miles from Cody at the East Entrance of Yellowstone National Park in the Big Horn Mountains of Wyoming, has a full-time fly-fishing professional on staff. Their expert and professional guide can teach you how to tie a fly and the techniques of fly-fishing. Accessible to all levels of fishing enthusiast, with a program that is fun for beginning as well as intermediate fly-fishers, there are any number of choice in the variety of streams, ponds and casting ponds upon which to make your catch. Fish for Brown, Rainbow, Cutthroat and Brook Trout. With exception of the Ride & Fish activity, the Hideout practices a catch & release policy. You’ve come a long way and didn’t pack gear? Not to worry! From waders to tack to flies the Hideout has you covered. Fly-fishing with their guide is included in your stay at The Hideout and the only thing you will need to buy is a daily fishing license. The Hideout’s Ride & Fish is a popular activity that combines the ranch experience with an incredible fishing excursion. Ride on horseback for approximately 45 minutes to a pristine mountain stream and fish for Brook Trout in the scenic nearby mountains and enjoy your catch prepared over a wood fire. 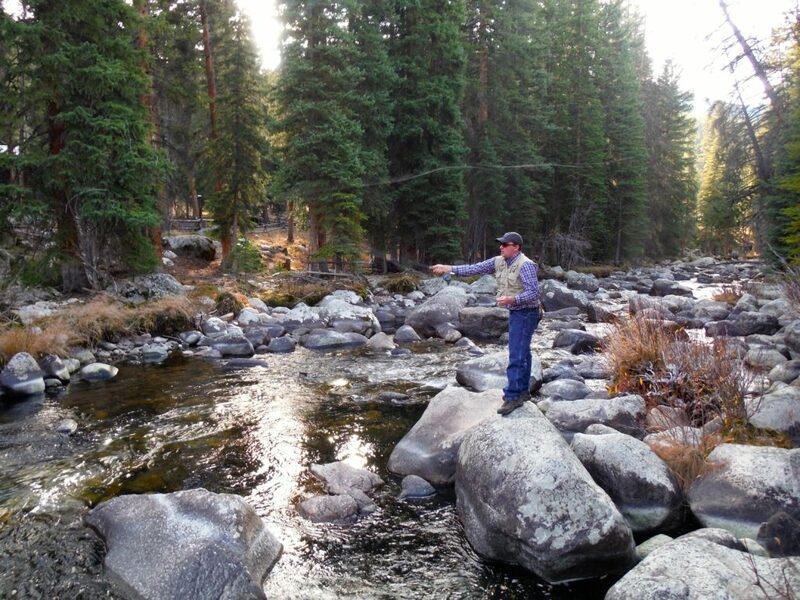 Paradise Guest Ranch, tucked away in the scenic Big Horn Mountains of Wyoming, offers guests with a penchant for angling an excellent fly fishing program with instruction, trout ponds, a full array of guided trips and even a full service fly shop. Their dude ranch fly fishing program offers myriad fishing possibilities: French Creek, teaming with cutthroat and rainbow trout, is literally out your front door, or you can take a cast into one of the nearby trout ponds. The expert Paradise guides are well-trained, which means you count on good fishing advice and a guide committed to your enjoyment, comfort, and satisfaction. During your week at the ranch you can take advantage of casting clinics, knot and fly tying classes and teach you how to strike, play and properly catch and release fish on their private trout ponds. Beyond instruction you can pursue group guided trips, private guided trips or take off on your own to our productive and varied surrounding waters. Looking for gear? Paradise has a full service fly shop right on property for your convenience. The fly shop is the place to sign up for fishing trips, attend a casting clinic, get gear for your next outing or find out what they’re “hittin on” from their group of experienced fishing guides! For those up for a little more adventure, Paradise offers pack trips to their high mountain fishing camp near the Cloud Peak Wilderness. The Rocky Mountain adventure ranch of British Columbia, located just south of Banff, Canada in the valley of 1000 peaks Three Bars Ranch, is bordered by a blue ribbon fly fishing river. Hike down to the river’s edge or float the river with a guide for the unique opportunity to enjoy some of the best cut throat fishing in the world! 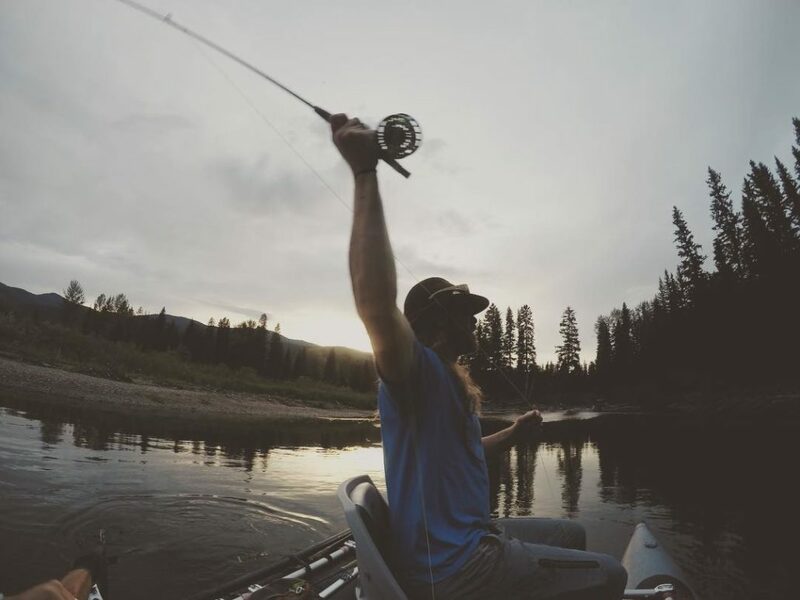 Only a short walk from the St. Mary’s River, which is considered to be one of the finest dry-fly fisheries in North America, you will enjoy Wild West Slope cutthroats from 14 to 20 inches long, and catch rates of 10 to 50 fish per day. As an added bonus, there is a good chance you will not see another angler during your float. Beautiful, scenic and blissfully remote, there is a delightful lack of angling pressure thanks to the absence of roads along the length of the river. Fortunately, Three Bars Guest Ranch controls over 7 miles of river, giving you exclusive access. If you haven’t brought gear, Three Bars has you covered and all fishing equipment is available from the lodge at no charge. If you’re up wanting a bit more serious angling, Three Bars offers the ultimate in fly-fishing adventure with their professionally guided day trips. Working closely with a local guiding outfit, the guides pick you up from the ranch for half or full day float trips. You’ll be provided quality equipment including waders, transportation, a boat, and professional guides and the trips include the bonus of a five-course gourmet lunch on the river. 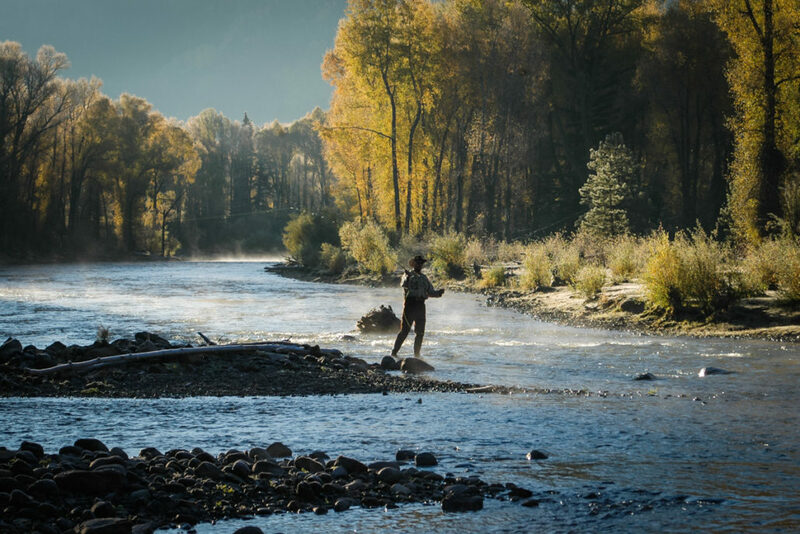 Here’s an incredible opportunity to enjoy one of Colorado’s premiere fishing destination with more than a mile and a half of private fishing on the beautiful Conejos River, flowing gloriously through Rainbow Trout Ranch. Catch magnificent rainbow and brown trout, fly or spin fishing. The ranch’s expert best-in-class fishing guides will ensure you have the best experience, delivering you to the best sites, instructing you in all the colourful nuances of the sport. Enjoy the ultimate in Colorado fly-fishing surrounded by the impeccable scenery of the San Juan Mountains where a variety of creeks and streams are within easy reach. Much of the gear and supplies you’ll need are available at the ranch Trading Post and while catch and release is encouraged, if you’ve made the catch of a lifetime, the exceptional ranch cooks are happy to expertly prepare it for a truly memorable meal. A 4 star guest ranch experience for over 65 years, Flathead Lake Lodge, in Bigfork, Montana offers incredible proximity to Glacier National Park as well as the best in fly and lake fishing in the west. The Ranch is located directly on the shores of Flathead Lake, the largest freshwater lake west of the Mississippi, spanning nearly 30 miles in length. It is also one of the cleanest freshwater lakes in the world. Montana is famous for its blue ribbon waters and hard fighting trout and the Ranch is happy to be your base camp, offering you all you need to explore the many lakes and rivers of the area. You can float the scenic Swan River in pursuit of native trout. Learn to fly fish on the Flathead River, where the fish can be as big as the river is wide. Grab a packed lunch from the kitchen and board a fishing boat for a day of trolling for monster lake trout. With the help of the Ranch’s skilled and friendly guides you’re assured that you and your family will be going home with some epic fishing stories!